Slide Check Racks Are Used For Use In Cafés, Diners, Restaurants, Cafeterias And Other Foodservice Ordering Applications. Slide Check Racks are made of sturdy stainless steel or aluminum construction for long lasting durability and dependability. 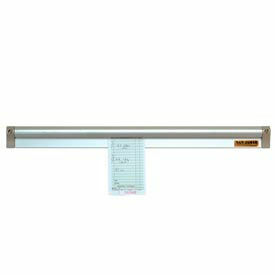 Various recognized brands offer wide selection of racks designed to securely hold checks or tickets in place while allowing lateral slide movement for foodservice ordering applications. Balls or marbles inside the rack keep checks in place while plastic end caps hold them in. Easily mount to existing wall or shelf. 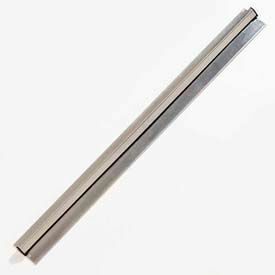 Available in wide range of 12 to 60 inch lengths. Carlisle Order Wheels And Racks Are Used For Restaurant Order Taking Applications. Carlisle Order Wheels And Racks are made of aluminum or stainless steel for long lasting durability and dependability. Racks and order wheels keep orders in clear view during preparation. Unique ball/spring clips allow for easy, one-handed check placement. Variety of sizes and mounting styles available to suit all applications. Types are 12 Clip Counter Mt. Order Wheel, 20 Clip Ceiling Hung Order Wheel, Order Wheel and Slide Order Rack. Color finishes are Aluminum and Stainless Steel. Dimensions and case quantities vary per model.